You are here: Home / Blog / Happy 100th Birthday, Dee Molenaar! Legedary Mountaineer Dee Molenaar turns 100 today! Join us as we wish him a very happy centennial birthday and look back at his fascinating life and meaningful contributions to the climbing world. June 21, 2018 marks the centennial birthday of Dee Molenaar. At 100 years-old, the legendary mountaineer and 77-year Mountaineers member has built an indelible legacy. His resume includes pioneering routes on Mt. Rainier, completing the first ascent of a Canadian peak with Senator Robert Kennedy, and sharing a microphone with Sir Edmund Hillary during a radio broadcast. Born to Dutch immigrants in June 1918, Dee spent much of his youth discovering the mountains of Southern California. He ventured northward to explore the glaciated peaks of the Pacific Northwest, where he served as a park ranger and mountain guide at Mt. Rainier National Park. After climbing Mt. Rainier over 50 times, he authored The Challenge of Rainier - first published by Mountaineers Books over 45 yeras ago and long considered the definitive work on the climbing history of Mt. Rainier. During World War II, Dee served in the U.S. Coast Guard in the Aleutians and Western Pacific. In 1950 he earned a degree in geology at the University of Washington and served as civilian adviser in the Army’s Mountain & Cold Weather Training Command at Camp Hale, Colorado. His career in geology took him across the western U.S., where he retired from the U.S. Geological Survey in 1983. Maynard Miller and Dee Molenaar (kneeling) at the finish of the 1946 Mount St. Elias Expedition. He climbed peaks throughout the western U.S., Canada, Alaska, Himalayas, New Zealand, and Antarctica. He participated in major expeditions to Mt. St. Elias in Alaska in 1946, Mt. Kennedy in the Yukon, and in the ill-fated 1953 American expedition to K2 in the Karakoram Himalaya. 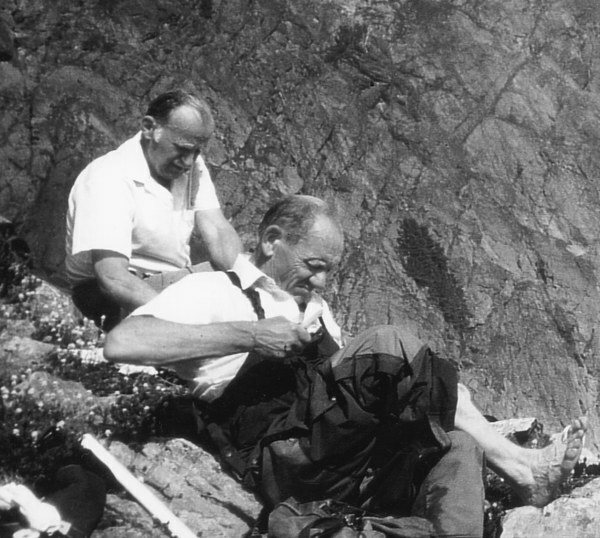 He was also a member of the Mountain Rescue and Safety Council, a group formed by Mountaineers members which eventually grew into the national Mountain Rescue Association. 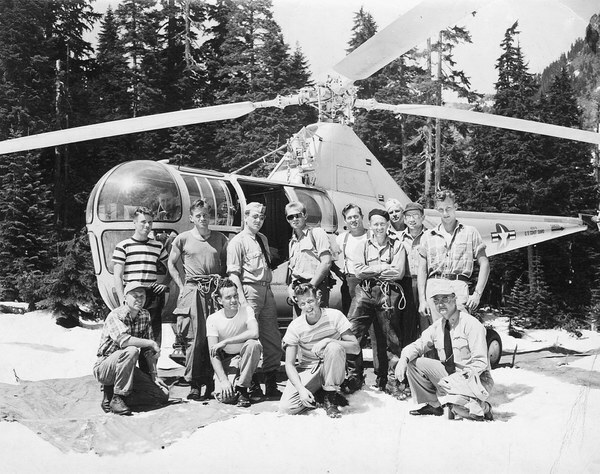 Members of the Mountain Rescue and Safety Council and a U.S. Coast Guard helicopter crew conduct practice rescue in 1949. Dee Molenaar stands second from left, with Jim Whittaker standing far right, and his brother Lou Whittaker kneeling third from left. An essential item in Dee’s pack has been a box of watercolor paints. He painted mountain landscapes from Death Valley to Rainier - and even completed a rendering of K2 from his tent 26,000 feet up the peak. His artwork and maps have appeared in books, exhibits, and art shows all over the world. 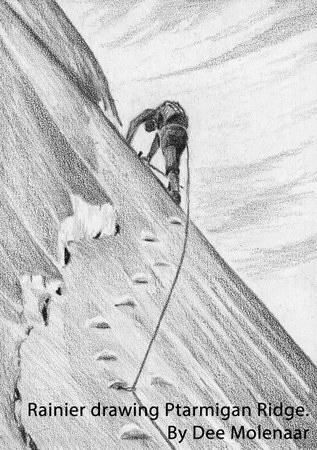 His sketches, like the one seen below, appeared in the first edition of Mountaineering: Freedom of the Hills, the very first book published by Mountaineers Books in 1960. A musty odor wafts up as we descend the narrow, creaky staircase into the basement. I’m following a surefooted 92-year-old man down the steps and into a cold, well-lit room. Paint, brushes, books, and stacks of papers cover every available surface. 'It’s here,' he says as he gestures me to follow him towards a large table. Under a cloth-covered canvas is a portfolio that contains a watercolor he painted at 26,000 feet.' I think I can get in the Guinness Book of World records for this,' he says proudly as he carefully hands me the painting. 'I painted it in our tent during the storm.' He’s referring to the storm on the American Karakoram Expedition to K2 that gained fame not for summiting the peak but for an act of heroism and a single belay, or as mountaineers around the world know it, “The Belay”. Today, Dee is the last surviving American member of the heralded 1953 K2 expedition (British climber, Tony Streather is 92 years old this year). But against the test of time, this adventure still stands with legendary status. In 1953, there had been very few attempts and only two successful climbs of 8,000-meter peaks, so no one knew much about the lethal effects of the thin air at those altitudes. Mountaineers didn't know that future generations would label altitudes of 26,000 feet and higher "The Death Zone" because the amount of oxygen is insufficient to sustain human life. At 28,253 feet, K2 is the second highest, most difficult mountain in the world to climb. Dr. Charles Houston, Dee Molenaar, Art Gilkey, Bob Craig, Tony Streather, George Bell, Bob Bates and Pete Schoening attempted to climb K2 in 1953. The climbers reached nearly 26,000 feet but were trapped, confined to tents, by a violent storm. After nine days, Gilkey collapsed with a nagging leg cramp. Houston determined that Gilkey had blood clots in his left calf, a dangerous condition called thrombophlebitis. If a clot broke loose and reached his lungs, it could be fatal. His only chance was evacuation from Camp VIII, even in a blizzard. With a unity of spirit and purpose, a heroic attempt was made to rescue Gilkey and get him down the mountain. They wrapped him in a sleeping bag and tent, and tried to rope-lower him down the route they had climbed, but were thwarted by avalanche danger. The next afternoon, reaching 24,700 feet on unknown terrain down a ridge, the men were at the top of a steep gully leading to Camp VII. Schoening was lowering Gilkey in the makeshift litter, using his ice ax, driven behind a boulder, as an anchor. The rope ran over the boulder, around the ax, and around his waist and hip to his hand. Craig had moved to Camp VII to set up two tents. Five other climbers were divided among three ropes, two of which were tied to Gilkey. All were exhausted by effort and altitude when Bell slipped. He pulled Streather down onto the rope between Houston and Bates, knocking them off their feet, then Streather hit Molenaar. As they careened toward a cliff, their weight came across Gilkey and the rope to Schoening. Schoening stood his ground. Somehow he managed to hold all six climbers and stop the fall. Houston was knocked out, three others injured. Craig, Bates, and Streather anchored Gilkey on the slope and helped set up the tents to regroup. When two returned for Gilkey, he was gone, apparently swept away in an avalanche. Dee Molenaar and Pete Schoening tend to blisters and bruises near the Fisher Chimneys following a 1991 climb of Mount Shuksan. Many years later in 1970, in a letter to Charles Houston, Dee wrote, “K2 1953 was the high point of my life in so many ways, and nothing will equal it. I’ve sometimes wondered in hindsight about whether or not our adventure really stacks up against the other famous mountain and arctic experiences of man.” Nearly 50 years later it’s safe to say it will. 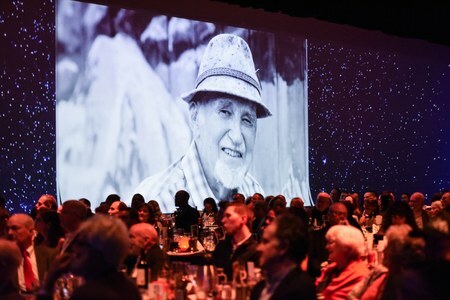 In 1992, Dee was given Honorary Mountaineers status, a title created in 1909 and bestowed on individuals who had made notable contributions to climbing, wilderness conservation, or to the club itself. He joined other honorary members including a Supreme Court justice, a woman who began her twenty years of conservation work at the age of sixty-seven, and the first American to climb Everest. On March 18, 2017, we honored Dee yet again with The Mountaineers Lifetime Achievement Award. The award is an annual honor given to a member of The Mountaineers community for their lifetime of contributions to the outdoor community. In so many ways, Dee exemplifies the values of The Mountaineers. His love of Mt. Rainier and dedication to sharing his love of “the mountain” with others and his bravery and selflessness are almost as legendary as his art and his book, The Challenge of Rainier. Throughout his life, Dee demonstrated great generosity, getting as much satisfaction from helping others achieve their mountain goals, as he did from achieving his own. Dee served and supported the mountaineering community for many years, as a climbing ranger at Mt. Rainier National Park. 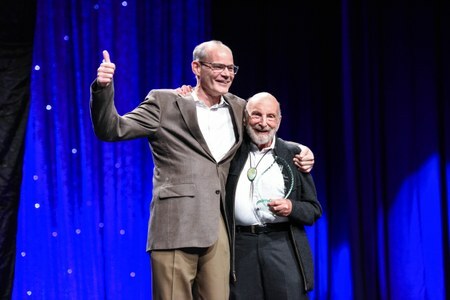 Accepting the lifetime achievement award on behalf of Dee was Tom Hornbein – a fellow Mountaineer and longtime climbing partner to Dee. As Tom was accepting Dee’s award, he talked about their friendship and the influence Dee made on Tom's life. The very morning of our Gala, Dee inspired Tom to hike Tiger Mountain in the rain. While hiking, Tom thought, "What kind of an idiot does this?" When he got to the top, Tom found he was "in the company of a whole lot of idiots!" Dee loved that story. As history has sown, a life spent in the outdoors, is a life well-lived. A portion of this article originally appeared in our spring 2017 issue of Mountaineer magazine. To view the original article and read more stories, check out our online magazine archives. Happy birthday indeed to Dee! Working with him on the 4th edition of "The Challenge of Rainier" was, yes, a challenge, and also an honor. "The Challenge of Rainier" was my only companion on a 14 day thru hike of the Wonderland Trail. I couldn't have asked for better company than the words on those pages. It's as if I had my own personal tour guide. Thanks for all of your contributions Dee, and a Happy Belated Birthday! It was my pleasure to meet Dee several times in the 1980s. I had read his book THE CHALLENGE OF RAINIER, and it mesmerized me into wanting to climb and explore Mr. Rainier. His artwork and words are amazing. Happy Birthday Dee.